‘Tis March and it’s the season for fresh Alaskan King Crab. 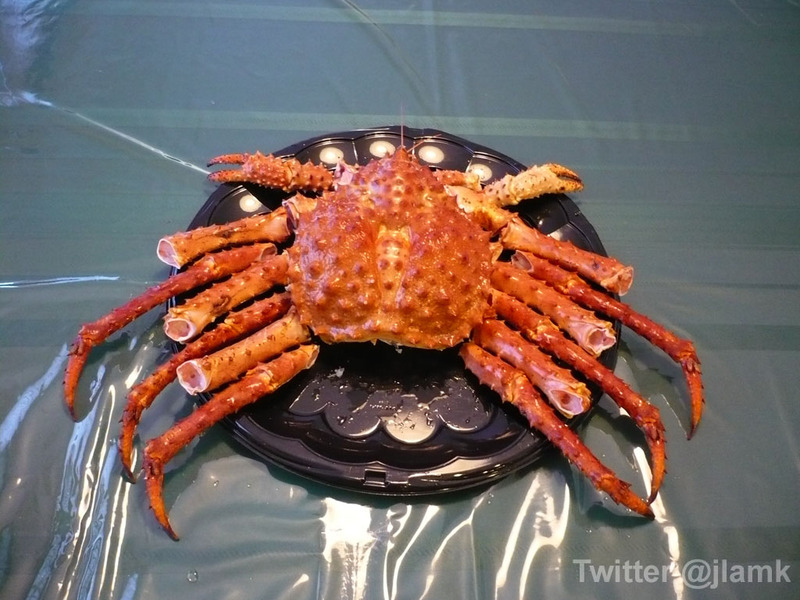 At 6.82lb, this Alaskan King Crab was of perfect size to be split between my parents and me. With fresh King Crab, we don’t do anything fancy. We go for the simplest way of enjoying the natural flavours of the flesh: steaming. The staff at the grocery store made it easier for us by taking the crab apart. When we took it home, we only needed to cut the legs into pieces, and with scissors, we opened up parts of the shell to show the flesh and spread some minced garlic on top before steaming. Each plate that you see here takes about 6 minutes to steam over water. It may take extra minute or so for parts that has more flesh – just to make sure it’s thoroughly cooked. 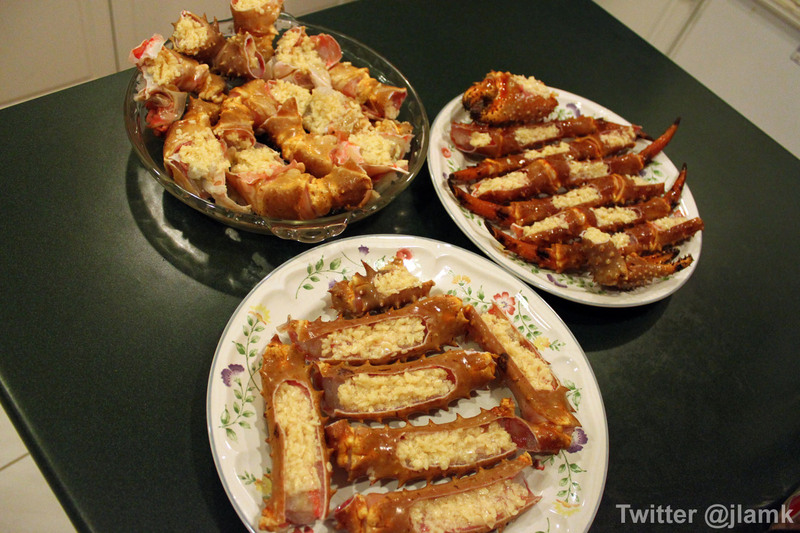 King crab meat is more like lobster meat than, say, Dungeness crab meat. 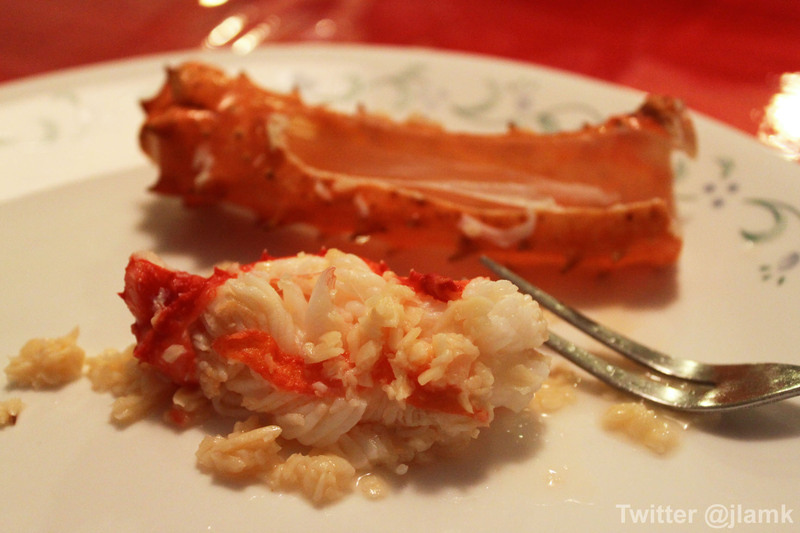 The texture, however, is less dense than lobster meat, less chewy. While we go for its original flavour, the minced garlic helps accentuate the flavours by adding a savoury taste to the naturally sweet flesh. It’s just super yummy. 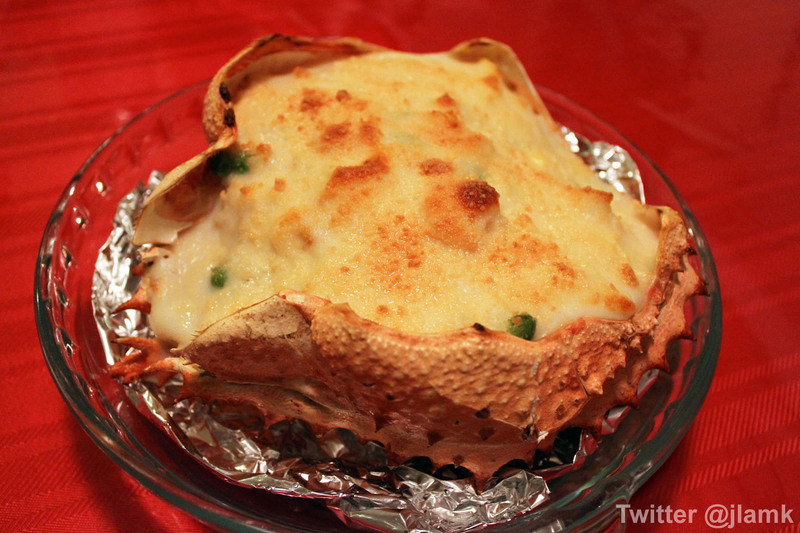 To wrap up this luxurious dinner, my mom made some seafood fried rice, stuff it in the King crab shell and bake it with some white sauce and cheese. It was really delicious. Have you ever watched a documentary series called Deadliest Catch on Discovery Channel? It’s eye-opening for me to have caught a couple episodes, learning how difficult it is to catch Alaskan King Crab when it’s rather accessible at grocery stores, fresh or frozen. It’s a dangerous business to be in, and the crabs aren’t exactly caught Ocean Wise. While it’s a tasty treat to have, we have to be cautious about what we consume and try to play a part in conserving the marine life. haha Mijune, yes it’s my mom’s cooking 🙂 We were inspired after we had it the first time at a restaurant, realizing how easy it is to do it at home instead. We could eat at leisure and it’s much cheaper too – paying for the ingredient at cost (instead of the marked-up price at restaurants) and there’s only labour work with no extra labour cost. It looks delicious. I want to go out and buy one now!!!!!! Where did you pick our crab? Trev: We bought ours at T&T Supermarket. They were running a promo at $9.99/lb, which is a decent price.